I was supposed to get an IS250SE auto. 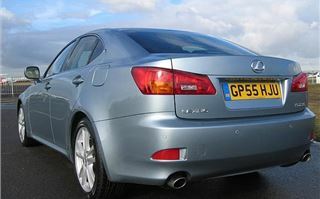 But due to press-refleeting it turned out to be a brand new manual with just 36 miles on the clock. Both have six speeds, so plenty of ratios to make the most of the engine’s top-end power. But changing them by hand was a chore I could have done without. That said, it’s a nice transmission. The lever has the heaviness of a big workshop lathe, together with the oily precision of a rifle bolt. So you can slot it from 6th to 3rd or 4th to 6th without any fear of hitting the wrong ratio. The only cog in the works was the ease with which the 1st to 2nd synchromesh could be beaten. Continuing with industrial analogies, the parking brake is like something out of a signal box, yet angled towards the driver and really nice to use (so no excuse for giving the guy behind red eye at the traffic lights). Though actually slightly shorter and narrower than an Alfa 159 the IS250 has very solid, ‘big car’ feel to it. Everything about it feels of the highest quality you can buy in its size and price range. Nicely chosen materials. Solid knobs and stalks. Rock hard ride. That was partly due to the 225/40 R18 front and 255/40 R18 rear tyres that identified the ‘Sport’ model I drove. Remember the old Peter Sellers movie ‘The Mouse That Roared’. Well, these were the tyres that roared. On anything but billiard smooth tarmac they turned what was otherwise an extremely refined car into quite a noisy one. They also affected its handling, seeming to make the car a bit twitchy on fast motorway curves. 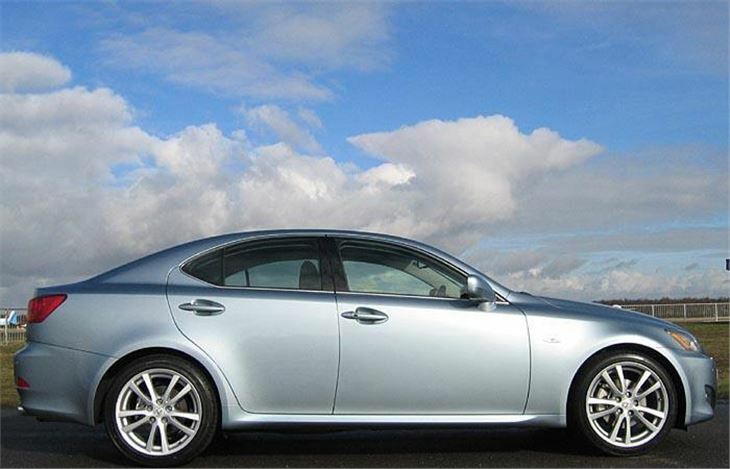 Happily, as with the Alfa 159 and the BMW 3 Series, you don’t have to have 18” wheels. Standard cars come on 205/55 R16s. SE and SE-Ls on 225/45 R17s. You can upgrade from 16” or 17” to 18”, but not the other way round, which makes sense because 18” only come as standard on the ‘Sport’ version. A nice feature is you can walk up to the car, jump straight in and drive away without having to fiddle with a keyfob. All IS250s come with a ‘smart’ key and pushbutton starter, which means you can leave the ‘key’ in your pocket or handbag while the car locks or unlocks itself. SE-Ls and Sports have 4 memory settings for the driver’s seat and steering wheel and the steering wheel automatically moves out of your way when you get into the car. I suppose you could play a trick on the driver by setting the seat so high and the wheel so low that once he pressed the starter the car would crush him to death. But I didn’t try that. The Sport has seats upholstered in a suede-like material called Cellensia that is very nice to sit on, and the rears are sculpted for two with space between and under the interior light for a small person or a child. 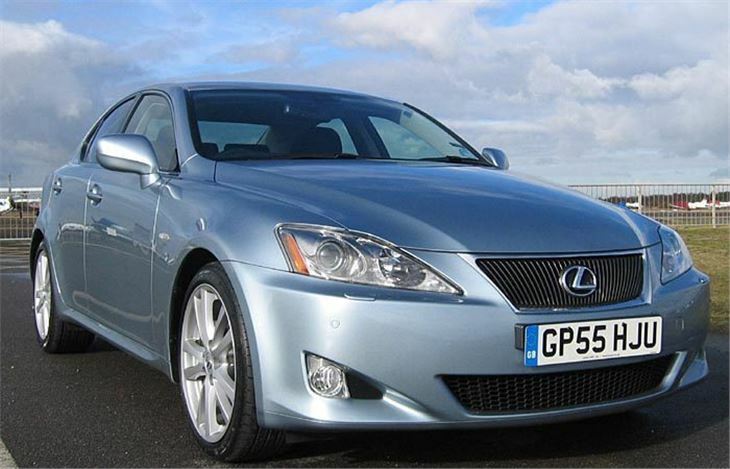 In that respect it’s no better nor any worse than a high-spec Audi A6, a BMW 3-Series or a Volvo S60. The Alfa 159 is more accommodating. The rear seat does not fold down, but SE-L and Sport versions have a folding rear armrest with ski slot. The boot itself is impressively upholstered with substantial chromed tie eyes, a compartment under the floor, and a spacesaver emergency wheel under that. For added security of the stuff in the trunk, there is a separate trunk lock/trunk release inside the glove locker that prevents it being opened with the button in the car or on the remote, though it can still be opened with the key. Out on the road, the fly by wire throttle sensor is heavily damped, so response in normal driving is never instant. This means you find yourself erring on the safe side when you would otherwise have overtaken. You and everyone else you may have encountered get to live, but you also arrive at your destination a good bit later than you may have planned. Just as well that the sound quality of the 13 speaker ICE system is excellent. I first heard ‘Put your records on’ by Corinne Bailey Rae on the IS system and she came over so beautifully I bought the album. Like everyone else, it now seems. 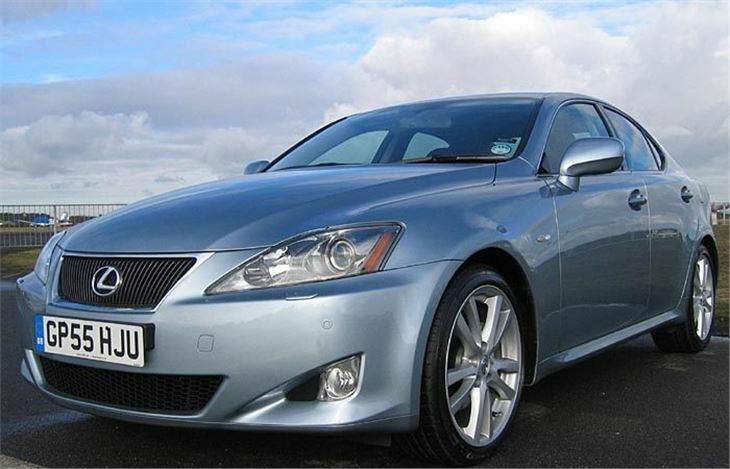 The obviously closest competitor is the BMW E90 325i, listed from £25,525 for the SE and £26,905 for the M Sport to £28,395 for the M Sport auto (leather extra). 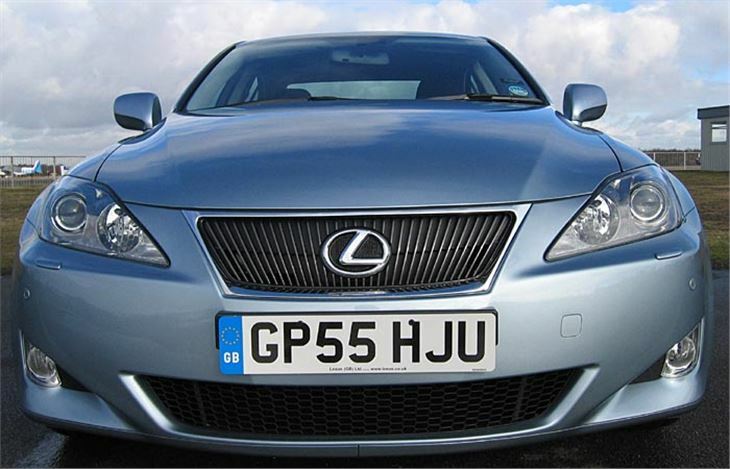 But, of course, the IS250 kicks off much cheaper at £22,400 for the manual and £23,400 for the auto. And that, plus the obvious quality of the car, plus the fact it isn’t a BMW, might swing it for many drivers. 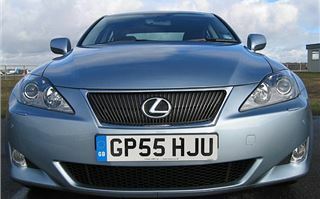 Others might put having a three-pointed star on the bonnet above everything else. The more adventurous might go for an Alfa 159. And the discreetly tasteful for an A4. 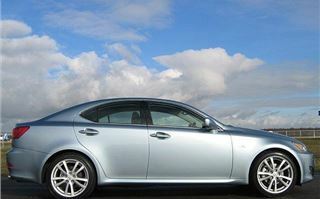 But whereas with the old IS200 you had to have the 6-speed manual rather than the 4-speed auto to get the car to go, the new 6-speed auto changes all that. Go for an IS250 6-speed auto on 16” or 17” wheels and you’ll get a car as refined as it is beautifully built. Finally a point about safety. 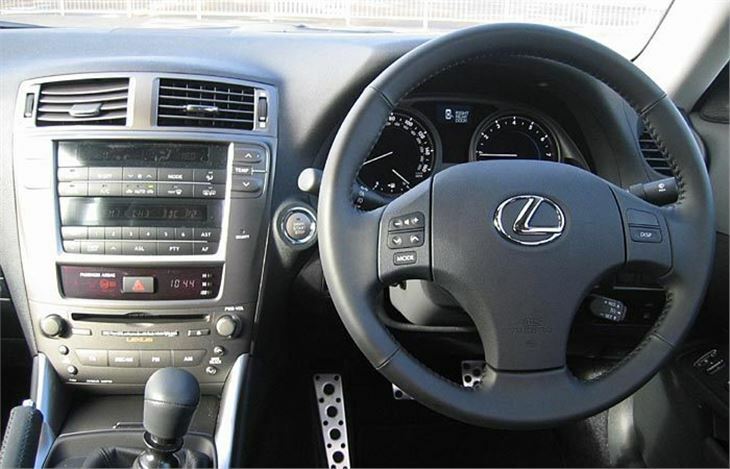 As well as crumple zones and pretensioners, the IS250 has front, side, curtain and even knee airbags. Having been involved in probably the first UK collision in an IS 250, Telegraph reader A.F. of Purley, Surrey, wrote to me praising the car for having saved him and his wife from serious injury. This is unlikely ever to happen to you, but if it does an IS250 greatly improves your chances of stepping out unscathed.